One of my favourite treats as a child and even now is Rice Krispies Treats. Not only because they soft, chewy, and delicious–they are so easy to make. Not to mention, rice cereal treats are easy to work with and make shapes with. Which automatically makes them more fun. 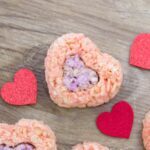 We made some festive Valentine’s Day Rice Krispies Treats, and you gotta make them this Valentine’s Day! So when your child comes home and says, “I need to bring in Valentine treats to class tomorrow,” you’ll be prepared. This is a super easy Valentine’s Day dessert that is a crowdpleaser. If you’re looking for other easy Valentine’s Day treats, check out our Poop Emoji Cupcakes, Red Velvet Truffles or a healthy Valentine’s Day dessert–Keto Chocolate Covered Strawberry Fat Bombs. Once melted, add red gel food coloring and remove from heat. 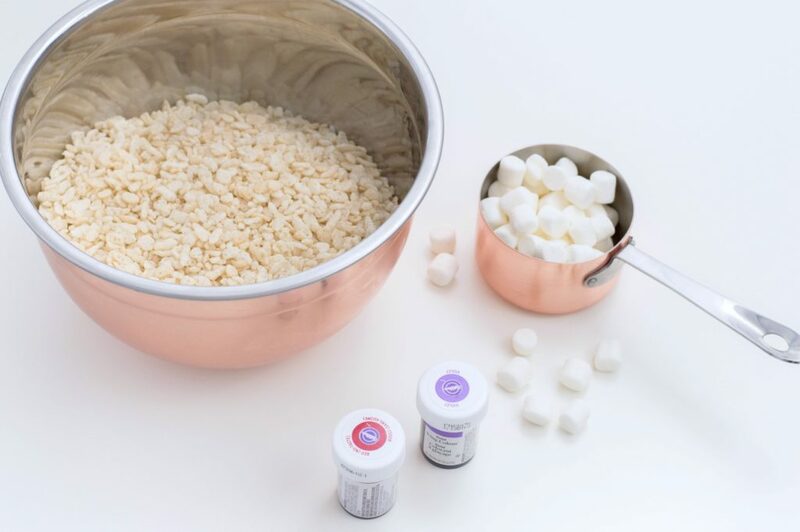 Mix until marshmallow mixture is well tinted and then add 3 cups rice cereal and fold. 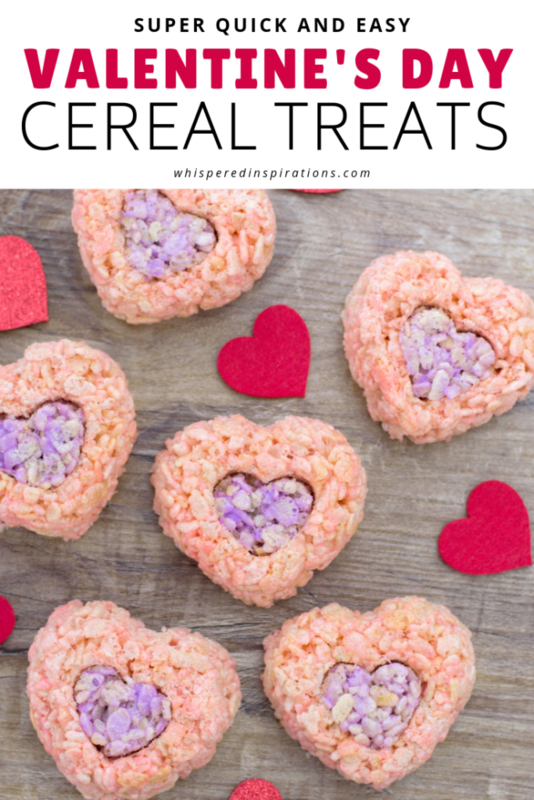 Press the pink rice cereal treats into each heart-shaped section of your silicone mold. 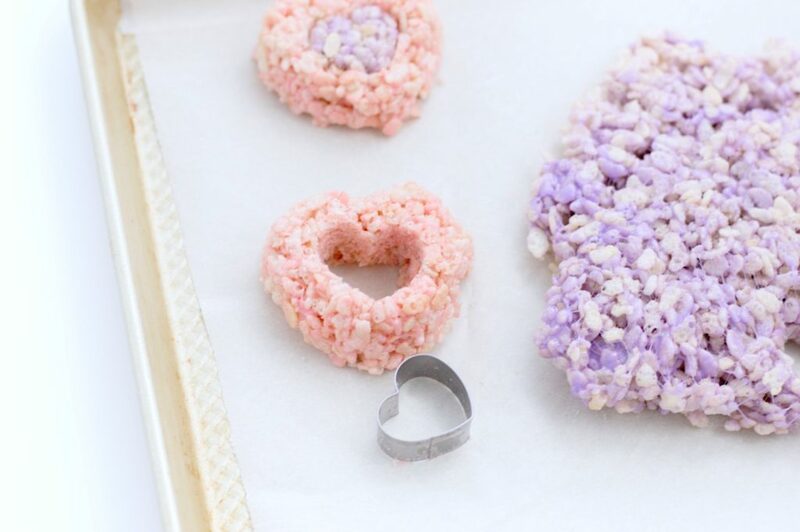 Using the same cookie cutter, cut out 6 small hearts from your purple rice cereal treats. Save the scraps to snack on later! Place the small violet hearts in the center of each larger cereal treat. There you have it, your Valentine’s Day Rice Krispies treats are ready to go! 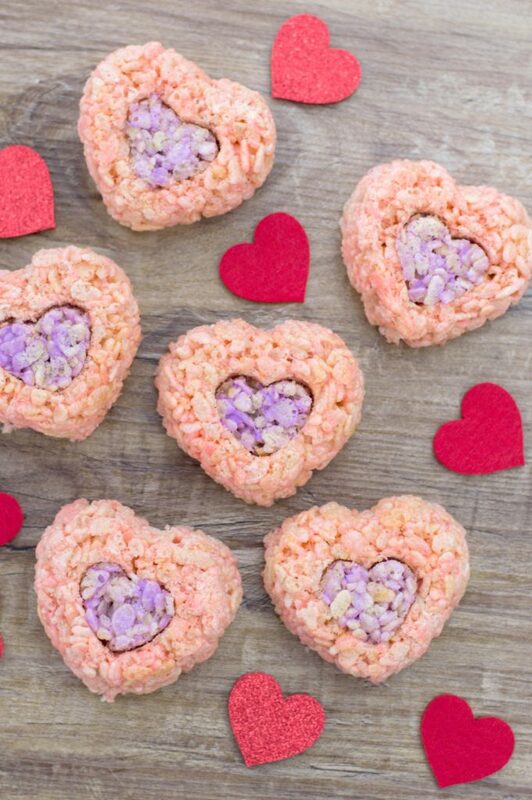 Super easy and fun heart-shaped Valentine's Day Rice Krispies Treats. Perfect for the office, Valentine's Day treats at school or for your Valentine. Even if you are your own! 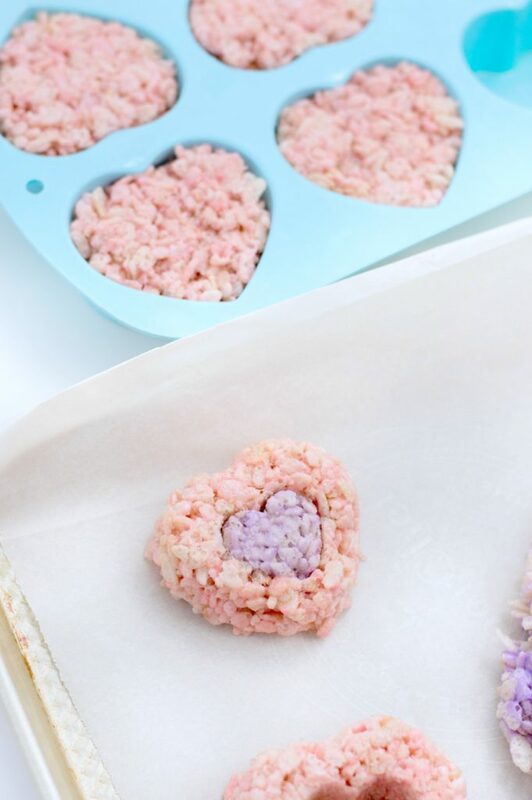 Using the same cookie cutter, cut out 6 small hearts from your purple rice cereal treats. Place the small violet hearts in the center of each larger cereal treat. Serve and enjoy! 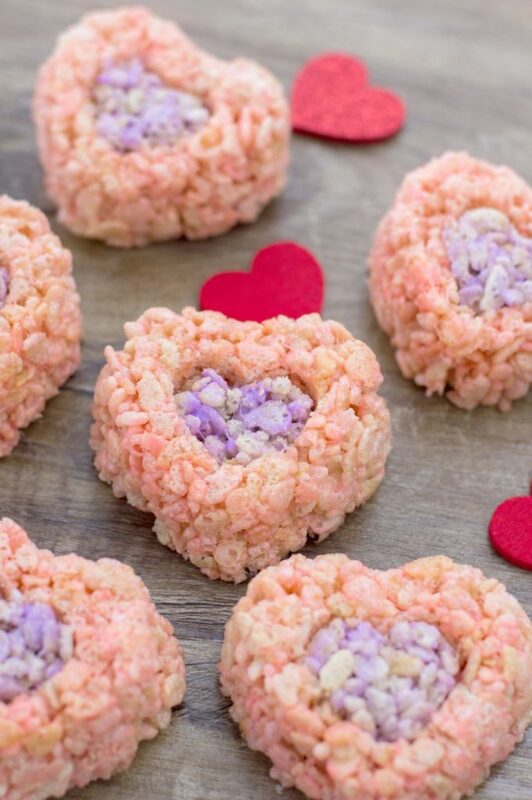 Now that you’ve whipped these Valentine’s Day Rice Krispies Treats, you can share the love with your kid’s class, the office, or your Valentine. Such an easy treat and it looks so pretty too, I must say! Looking for more inspo? If you scoured Google, look no further. Try these easy Valentine’s Day treats, check out our Poop Emoji Cupcakes, Red Velvet Truffles or a healthy Valentine’s Day dessert–Keto Chocolate Covered Strawberry Fat Bombs. You really can’t go wrong with these. Simple but, festive–right? Our kids love Rice Krispies treats! They’re sure to love these! They look fun and easy to make! So easy! Hope they enjoy them. Oh these are so cute! What a great idea. I am always looking for fun and exciting ideas for each holiday and these are perfect. I need to step up my game now! Awesome, these are so easy! 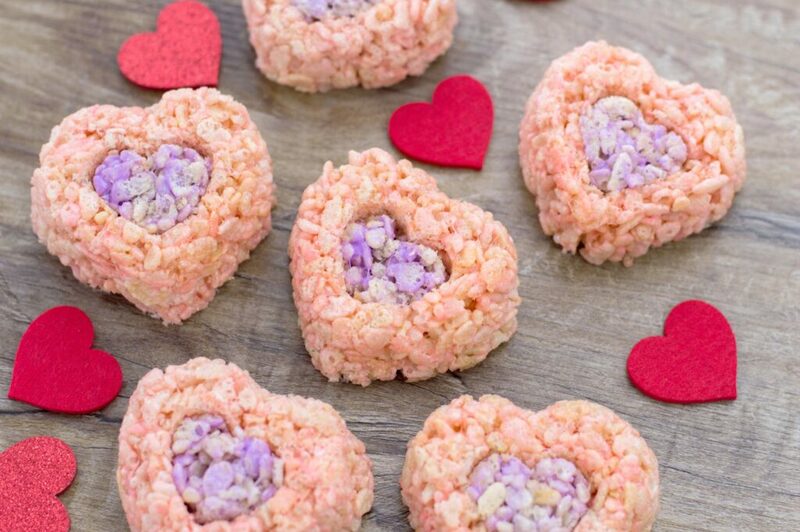 My family loves Rice Krispie treats and these are the perfect treats for Valentine’s Day. I know the grandkids would love to help me make these. So cute! Thanks so much! Yes, they totally would have fun! Everyone loves rice cereal treats and they are so easy to make. Love the heart design and adding the colors are always a plus. These are gorgeous and look so yummy. I love Rice Krispi treats. When I tried to make some for Valentine’s Day they flopped royally. lol I should try yours and see if I can get them to work! Hope they turn out this time! Rice Krispies treats are a weakness for me. I can’t wait to make these with my little guy. He will enjoy it. OMG, me too! Hope he enjoys them. I like how easy it is to dye rice krispie treats. They make cute holiday treats for a wide range of occasions. So simple! I completely agree! Those are adorable! My kids love Rice Krispie treats. These would be fun to make together as well. I love the pretty colors! Best part is you can make them any color! OOo yum. I just love rice krispy treats. I need to make them for sure. It’s been ages since I’ve had them and these are pretty. They are so good. Soft, chewy, and delicious, right? Oh my goodness, those are so cute! I’ve never seen them made like this before! I love how you mixed it up! Those are fun and easy and I know it would be a good family night thing to do together. I like the idea of making these for Valentine’s Day. It does not cost a lot of money and the kids love it. Yes! Affordable, festive, and delicious. I love rice krispies treats and think they are seriously underrated. These look great for Valentine’s Day. 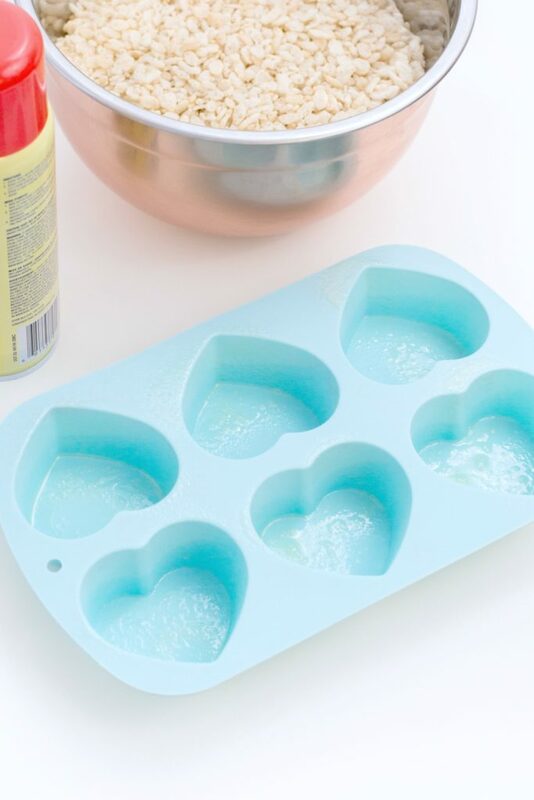 I need to pick up that mold because this recipe idea is super cute. I would make these for my kids on Valentine’s Day. I don’t care if they’re older, it will be a fun treat for them to enjoy! Yes, they are great for any age! These are beautiful and perfect for Valentines Day. I would love to make these with my daughters. Thanks so much! I hope she enjoys them. These look really good and I’m sure kids love them. Rice Krispie treats are always good. Always, they are a crowd pleaser. First of all, I love the design it really suit the coming Valentines day. This looks really good and delicious. It’s very easy to follow the instruction and not that hard to make. Thanks, it is very simple! This is a great new variation on Rice Krispie treats. It’s the perfect snack or dessert for kids for Valentine’s Day, birthdays or any special occasion. Yes, and so, so, so, simple! These are so fun and colorful. Who doesn’t love Rice Krispies. Great easy to follow recipe. Happy Valentines! These look amazing! This would be a great recipe to try with my daughters. They love baking and this would be such a simple way for them to be able to help out. This would work great for their Valentine’s party at school too! Yes, a great way to start. My kids loved Rice Krispy Treats. Unfortunately, I never thought outside the pan and just made them the regular way. These are much more festive! They are so easy to work with, you can make anything with them. Ooo! I love these! I would love to make a batch of these this weekend. It is snowy and cold but I am thinking more about Valentine’s Day! So simple too, cannot go wrong. We are fans of rice krispies over here. This looks like an adorable treat for Valentine’s Day. Love it! How cute are these rice krispies! A delicious treat that anyone can make, even my kid. He will enjoy it a lot! Awesome, hope he likes them. Well now this looks like a super yummy and super cute Valentine’s Day snack! YUM! Yes, so easy and tasty!